We're working on a public Jira board. Upcoming major features Please note that this list is in random order and is not intended to be comprehensive. For most of these features, no timetable has been established for when the feature will be added. Some may appear in updates in the next few months while others may not be added for years. The time to implementation and priority order for each of these features depends on a number of variable factors, including code contributions from community members, available funding and staff resources The best way to ensure that a feature you care about is implemented quickly is to support it by contributing your time, skills, or financial resources to the project. Android, IOS and Windows apps for playing H5P files offline with xAPI support and other features.. I see that there is no current plan to integrate h5p with Moodle. Does this mean that I will have to create a Drupal (or Joomla) site to create and edit content, before transferring this to Moodle? Companies are creating platform integrations for new platforms and sharing them. Hopefully H5P will be available for Moodle soon, but I'm not aware of anyone working on it at the moment. Work is beeing done on a Wordpress integration at the moment. Hi, how can I go about installing it on WordPress that has LearnDash as LMS? I'm not familiar with LearnDash but I would guess that you installed it like a normal plugin? What version of wordpress is this? I saw here that you would be considering LearnDash integration. Will it soon be possible (or is there already a way) to integrate H5P content as quizzes in a LearnDash LMS? Hi, we haven't been able to pursue this yet. Will be announce in our newsletter if and when we get this in place. Nothing concrete yet I'm afraid :/ I don't know how well the various LMS plugins are working with H5P but we will be checking it! We are able to use H5P content on along with Learndash and wordpress. There are some limitations but the H5P contents work any major issues on Learndash LMS. Good to hear. I would be good to know what the limitations are? That is correct :) Thanks for reporting! Would love to know if this will be an option. Any update on the progress toward the 31.12.14 milestones (especially the xAPI support)? I'm afraid we're a bit delayed. I hope we'll have everything released this month except Joomla and the improved embed code. We will revise our three year plan later this month and will have to reschedule Joomla and the improved embed code. Great! I look forward to the new releases. Thanks for the update. I can't wait for the Moodle release! I hope it won't be delayed. Are you planning to support Drupal 8 as soon as it's being released? We hope so too, and we're actually revising our roadmap later today, and I hope we'll be able to add Drupal 8 support this spring. Sorry to follow up on this topic as I am sure it is covered elsewhere. Do you have an ETA for supporting Drupal 8? The H5P core team have started to work on Drupal 8, but we have no sponsor for it yet, and currently we are fully booked with other work that we do have sponsors for. It will be hard to give an ETA since witch platforms we support very much depends on witch we get sponsors for. How is xAPI support going? Great to see this open source HTML5 authoring tool, even better, xAPI support is listed. How is it going? Thanks, I hope to merge all the xAPI code to the master branches this evening and release it next week. Create a section where Trainers can upload their Ppt/Doc/Pdf online to the portal and which gets converted into different frames/slides ( page wise) which the Trainer can then select a particular slide/frame and add Audio to that. After adding audio, publish it as a Course ( elearning ) which plays with the audio attached to the slide shown. Option to scroll forward or backwards. It should also allow inserting VIDEO link either from Youtube or from our desktop. I think the goals you've got for this month are going to be fantastic. xAPI support in particular is going to be massive for us and I'm looking forward to seeing how that's implemented in Drupal. Keep up the good work guys! You're really on the spot. I'm also looking forward to see the Drupal implementation and xAPI support. 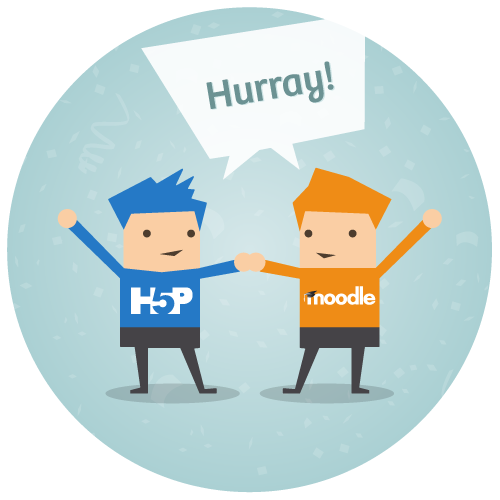 FIrst of all H5P is fantastic and it seems logical to be integrated within Moodle as a standard part of Moodle. So what has to happen for this to be a robust Moodle plug in? The H5P Team had it on the roadmap, but we currently have so much paid work with deadlines that we have no time left to do things that no customer is willing to pay for. If someone steps up and creates a full Moodle integration we're happy to provide advice. Also if someone would like to order a Moodle integration we're happy to provide a quote. I deleted alokr's account due to your report of him trying to steal information and charge people 50 USD to access his "demo"
Is this fantastic platform for sale and when? My compliments for all the work your team has done. I understand this project is temporally. Do you have plans to bring this platform to the market and if, when? The platform is free. It's being developed very quickly and it's stable and being used by websites with hundreds of thousands visitors per month. would it be possible to1. 1. have a monthly release, no matter how big or small changes to the code base? 2. regularly (e.g. bi-weekly) update this page about what will be implemented in next release and future releases? 3. list the features that are inline with H5P's goal but require additional volunteer to speedup the development/testing? this information will help to keep all active users informed, so that they can plan their adoption of H5p or plan their time to help on this if it is possible. We're aiming for monthly releases yes, with a minor release in between. We don't set a fixed release date, we release when our qa process is done. Previously we published longer roadmaps, and we do have a much longer roadmap :) - but paying customers made us constantly re prioritize and people who waited for planned features that got replaced by lower prioritized features that customers paid us to finish got dissapointed so now we only publish things that we are pretty sure will be implemented within the given time frame. Maybe there are good reasons to change this around? Good idea, we'll try this! 1. not necessry to be a fixed date for new release, but monthly release is important. 2. roadmap isn't necessary to implmenet immediately, understand that paid work should be 1st priority. it can be splited into two list, one is shorter list and can be implemented in next release, another one is a longer list and it would be implemented in furture releases depends on priority and manpower. it will help active users to plan and participate the open project. we really like the concept of H5P, and would like to see it success. Agree! We're working on finishing up the next release now. We were very sorry that we were unable to do the march release but we think the xAPI improvements and resume features will make it worth the extra wait. We've added a list of major upcoming features now. thanks, the features list is impressive. Still on the roadmap, no eta. Still on the roadmap, no eta. sorry. It keeps getting delayed due to paid work being prioritized higher. Any news on a Moodle Plugin? It's not being worked on by the H5P team and we have no ETA and no sponsor for it. Would this work with Articulate and does this allow my students to complete activities off-line, and me to be able to track them? There are no Articulate integrations as far as I know. H5Ps may be used offline if the H5P player works offline. Currently the easiest way to achieve this is by installing a local web server which rarely is practical but I know H5P has been installed on offline computers on museums. In the future H5Ps may be downloaded and used offline with H5P apps for phones, tablets and PCs. Can't wait release 'Advanced Text Editor' for Drupal module with support for rich-text-editor and insert HTML code. Really exciting use Image-Hotspots , but also desperately need for html mode or advanced text-editor. Thank you for the feedback. Noted! Hi, I have think about some features could be introduced to H5P, do you see it is possible to put into the development queue? Store and display the detail test results, not only the score. Question Set, use a kind of link to link to an existing Content - So that they may be reused? Delete H5P Content Privilege in wordpress - Do you use a wordpress plugin to give roles different rights/privileges? Search for content - Noted! More sophistic Score System in question set - Noted! Free Text Input plugin, for composition/essays - Noted! Audio/Video Input plugin, for verbal,visual submission assignment - Noted! mobile responsive support - What do you mean? Most of H5P already should work on mobile. display shortcode/Content ID in files list in wordpress - File list? Are you using a plugin for that? Thanks for your quick reply. see this. Question Set, use a kind of link to link to an existing Content - So that they may be reused? >JPE, yes, for reusing built Content, reference instead of copying would be good. introduce Tag, Category for Content - Noted! (this exists in Drupal since H5Ps are nodes in drupal and nodes can be tagged) >JPE, hope both category and tag could be implemented in Wordpress soon also. Delete H5P Content Privilege in wordpress - Do you use a wordpress plugin to give roles different rights/privileges? >JPE, yes, currently in Wordpress plugin, the privileges doesn't have Delete Content control. versioning, maintain version history - Noted! (this exists in Drupal since H5Ps are nodes and Nodes can be versioned) >JPE, hope it could be implemented in Wordpress soon also. Store and display the detailed test results, not only the score. - This will be achived via xAPI and backend evaluation of answers >JPE, it is great. drawing board plugin, for drawing assignment - Noted, I think one of Joubel's employees has been playing around with this already, >JPE, greated, I got a script with similar function, http://www.studyhan.com/online-chinese-characters-drawing-board/, I put it in H5P iFrame, how could it be integrated into a plugin? mobile responsive support - What do you mean? Most of H5P already should work on mobile. >JPE, current implementation is still fix layout. can't really fit into different screen size. but this could be difficult to implement. display shortcode/Content ID in files list in wordpress - File list? Are you using a plugin for that? >JPE, yes, in Wordpress plugin, the list of Content doesn't have Content ID as a column, so it could be known only through "Add H5P" button in New Post screen. it would be faster to have a Content Doc ID in Content List for editor to add new H5P object in a post. 3. What Wordpress plugin are you using for giving users privileges? 11. Where is it fixed layout? In the editor? 12. What Wordpress plugin are you using to display file lists?